If you want to pug please you a healthy appearance and vigor for many years, take care of his nutrition from puppyhood. A balanced diet for dogs of small breeds, including pugs, prevents the development of diseases related to the lack of nutrients in the animal body, allows to avoid the development of infections and other health problems dogs. When you bring the little puppy pug in the house, the first ten days, feed it the same food it received from the former owners. Usually, puppies are handed out around the age of 8-9 weeks. If mopsink got ready industrial feed, keep giving it to him, strictly following the recommendations written on the packaging. Introduce new food gradually by adding parts (start 1/5). Completely go to a new diet in five to seven days. At this age the puppy should be fed at least 5 times a day at equal intervals of time. From the age of three translate pug on four meals. Do not offer the puppy food from the table if you plan to feed him homemade food, Prepare it separately. Diet little pug should look something like this: first feeding - porridge with meat broth, with vegetables and chopped cooked meat; the second — porridge; third raw meat; fourth — cottage cheese or yogurt. Once a week add in the food of mopsink half boiled egg yolk. Make sure the bowl puppy has always been fresh water. Porridge for pug brew from buckwheat groats, a Hercules, oatmeal, rice (rarely, because it contains a lot of carbohydrates). As a rule, a puppy, more like a crumbly mess. Meat diet may consist of beef, mutton, horse meat, Turkey meat, chicken. Meat let the puppy raw (it has more vitamins), or boiled, most importantly, that it was not greasy. Cut it into small pieces, at first, can be crushed to a state meat. Once a week replace meat serving low-fat sea fish (always cooked!). Pugs are happy to eat vegetables and fruits. Since the age of three, include in the daily diet of the puppy grated raw carrots, lettuce, cabbage, spinach and other raw vegetables (except potatoes). They can mix in small amounts to meat portions. For the prevention of rickets and normal growth of the skeleton, add food puppy mineral supplements. They can be purchased at a pet store. If mopsink trained to eat manufactured food, it is not necessary, since these foods usually contain everything necessary for the development of puppies and minerals. As they grow the puppy go to three times a day (7 to 12 months), and by the age of one year – two meals a day, keeping the normal daily diet. 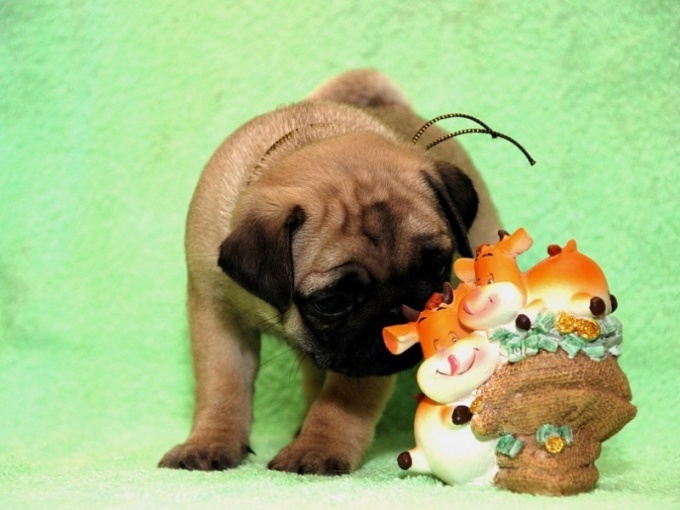 Pugs love to eat and rarely leave food in his bowl, so do not overfeed the puppy. Excessive feeding contributes to obesity of the dog affects their health in General. Dog food – the basis of her longevity, health and good mood. Today becoming increasingly popular dry food. Use them just, they are quite economical and balanced. However, the diet of a pug should be approached carefully. What to feed a dog, natural food or dry food, chooses its owner. If you decide to have a pug, carefully read the rules of the power of this breed. The problem is that the dog is practically omnivorous, allergic, very full-bodied and requires a large amount of vitamins. Allergies have nearly all pugs. Main products, causing severe dermatitis poultry and fish. Also unpleasant rashes can cause dairy products, some vegetables. Natural feeding pugs, at first glance, seems simple. However, breeders are recommended to use food grade fresh meat (mainly beef, tripe), vegetables, dairy products. The food should be firm, always new, any other products is strictly prohibited. Also special vitamins: they will strengthen the bones and joints of the legs, which is necessary to sustain the considerable weight of the body. With dry food all the more elementary. Quality products have a balanced composition, which clearly distributed vitamins, minerals. You will also be able to choose the optimal ratio of fats-protein-carbs. Through the precise recommendations, you will be easy to control portion – a dog will always be fed, but not overfed. If you decide to use dry food for feeding pug, seriously go to the product selection. 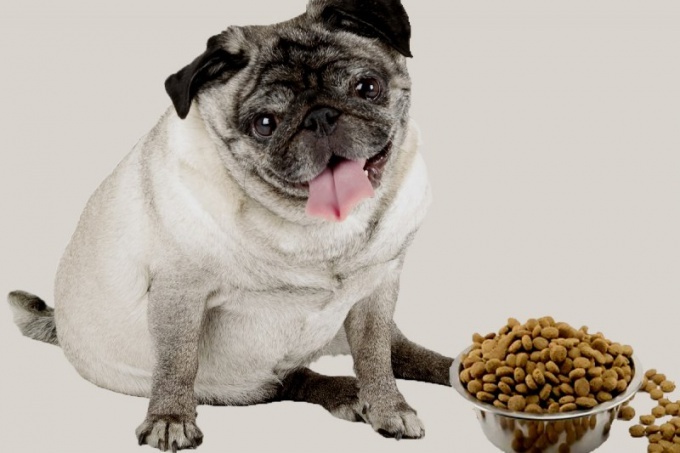 Not every dry food will do fine, allergic to the dog breed pug. Remember: many products sold in pet stores, do not meet the high requirements. Always avoid food sold by weight, and colorful food. The dog still what color the filling of the bowl, and dyes can cause in a pug severe dermatitis and inflammation. Never practice mixed feeding: natural and dry. For digestion of each stomach needs its own environment. When mixed diet the activity of internal organs is disturbed. Special attention deserve the "pedigree" of the feed. This line is from the famous manufacturer Royal Canin. However, to feed such food should not all pugs. The fact that the basis lies Canin products from poultry meat – chicken. To avoid allergic reactions, it is better to find a more suitable food. For pug breeders recommend to purchase feed super-premium. They are best balanced in vitamins and minerals, the manufacturers use only quality products. Also, many feed high class, there are herbal supplements that strengthen the immune system, improve digestion, protect from many infections. Of brands, producing food of high-class pay attention to Orijen, Acana, Go Natural Holistic. Most often, the owners of pugs prefer products, a key element of which is lamb, duck or fish. Noteworthy also is the German food of super-premium Wolfsblut. The manufacturer offers a wide range of tastes: from traditional lamb to exotic Australian kangaroo. Plus data feed is also public information about the ingredients, the content and amount of trace elements (important for pugs who have had any diseases). Minus – in retail stores, they are almost not to find. Basically, they must be ordered via the Internet.